Älsa, a new focus + energy supplement mix, is an ideal gift for active adults who have it all, but are seeking an extra boost to enhance their daily routines. 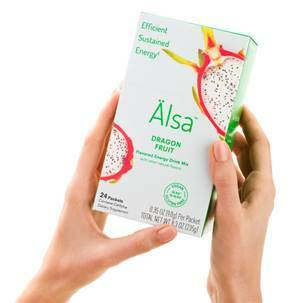 Introduced in 2015, Älsa is already garnering attention as a strong alternative to the market’s many energy drinks as it sets itself apart with myriad benefits through its blend of Cognizin® citicoline, which is clinically proven to provide enhanced focus and memory function; and PURENERGY®, a patented ingredient that combines caffeine and pTeroPure® pterostilbene for sustained energy. Älsa contains 14 essential vitamins and minerals, amino acids L-Carnitine and Taurine, and is rich in electrolytes. The product is also gluten-free and vegan. Älsa is naturally sweetened and comes in three flavors – Pomegranate Blueberry, Three Citrus and Dragon Fruit and can be dissolved in 16 ounces of water or added to your favorite yogurt or smoothie! Each serving of Älsa comes in a slim packet—easy to carry in even the smallest purse or backpack. A box of 24 Älsa packets costs $39.50 on the company website, Amazon and ProHealth. I like the fact that it is naturally sweetened, and the flavors are unique compared to other energy drinks. It's also a good option for those who can't have gluten or choose a vegan lifestyle - both of which can make it hard to find suitable products.